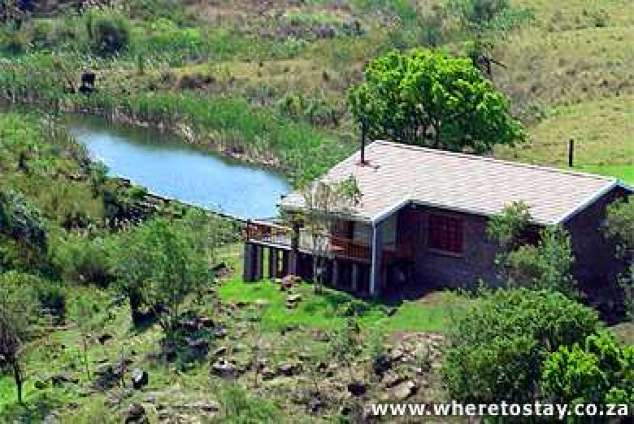 Nkunzi Lodge - Melmoth Accommodation. The lodge is situated on a working Brangus cattle and timber farm,Melmoth on the Babanango road, close to the Makoseni valley, within 1.5 hours drive from the Umfolozi Game Reserve (Cenini Gate), Isanlanana and Rorks Drift. If you are after peace and quite in tranquil surroundings, you need to get away from it all and be a little out of reach, this is the place to be. The lodge sleeps four in two well appointed bedrooms, with separate bath toilet and shower. An open plan lounge dining room area is serviced by a Jetmaster fireplace for cold winter evenings. (Firewood provided). The kitchen is fully equipped and there are outside braai facilities available. Linen and towels are provided and the lodge is serviced daily. There is no television or telephone. A 30sq meter wooden deck overlooking a delightful waterfall and weir contribute to the restful ambiance of the environment. The farm is suitable for hiking, mountain biking and quad riding. A unique indigenous tree trail with many different species has been developed, in conjunction with a very healthy bird count. For the bass fisherman, good fishing is available free of charge to guests in three dams within 30km from the lodge. 20218 page views since 06 Feb, 2006.